Another from the parental "No" files - this one from a frustrated Canadian mom. She told me the story of her child's school and their campaign to collect pop tabs from cans of soda-pop to help raise money for their local Ronald McDonald house. The campaign involved kids from Kindergarten through Grade 4 and prizes were awarded to the kid and the class who collected the most tabs. Ironically it was organized by the school's health teacher. Now this mom's all for charity, but wonders whether or not the task and the competition attached to it wouldn't in turn encourage the community's consumption of soda pop, lead young and impressionable children to tie soda pop consumption with the very important and positive emotion and message of charity, and further normalize soda's regular consumption. Apparently her child's school, collected 3 large garbage cans full of tabs - 90 gallons worth (340 litres for us Canadians). Looking online it would seem that scrap aluminum sells for somewhere on the order of $0.30-$0.60/lb and that a gallon milk jug holds roughly 4,000 tabs and weighs roughly 3.3lbs. Crunching a bunch of numbers tells me this: A health teacher linked drinking soda pop with being charitable in the minds of kids between the ages of 4 and 10 and in so doing helped to galvanize her community of only 3,000 people to drink 360,000 cans of soda pop (an astounding 120 cans per resident) all in the name of raising a measly 133 dollars and 45 cents. Now I'm all for raising money for charity, but is this really a wisest and best way to do so? Couldn't the health teacher come up with an actually healthy behavior with which to raise funds, let alone one that raises a more substantial sum? To give the briefest of examples - a few weeks ago my 3 little girls set up an organic vegetable stand at the end of our driveway to support their CIBC's Run for the Cure fundraising efforts. In just 1 hour of selling our home grown cucumbers, oregano, and basil they raised 115,200 pop tabs worth of money ($48). And if garden vegetable sales aren't the school's thing perhaps the kids could clean up local parks and go door to door asking for donations? Or how about a used book fair? Or a physical activity fundraiser where the kids ask for sponsorship? Or a kid run car wash? Now this mom did in fact say "No" to drinking soda for Ronald McDonald House, but I wonder how many kids' parents, when asked while shopping with their kid if they could buy some soda to help raise money for kids with cancer, didn't pick up a case or two they wouldn't have otherwise? 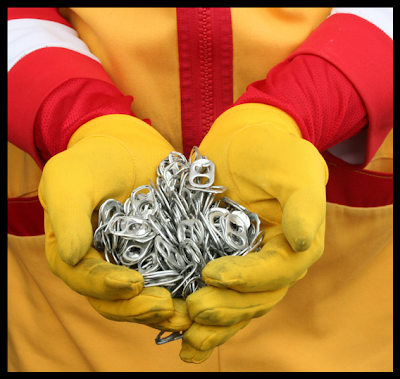 Does your school collect pop-tabs for Ronald McDonald house? If they do, please show them this post - there's no doubt there are healthier and far more lucrative ways to raise money for charity than to promote the consumption of soda pop.